Sure, fundraiser discount cards have been around for many years – but if you haven’t given them a try when your group or organization needs to raise money, you have no idea how well they work. Think of the usual methods people have been using for decades to raise funds: car washes, bake sales, candy bar/cookie dough sales, jerky, candles, popcorn, even catalog sales, to name a few. Other fundraising methods are certainly good, in that products like magazines or cookies provide you a means to make money, but fundraiser discount cards go even further. Because they’re targeted to the merchants (and consumers) in your community, those merchants get business because of the discount cards. Unless you’ve been living under a rock for a decade, there’s hardly a doubt that you have heard of fundraising discount cards. 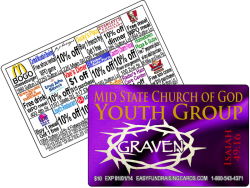 It’s truly amazing that so many churches, schools and other organizations continue to go about raising money the hard way when fundraising discount cards make it so easy! There is far less work and effort involved, the product sells incredibly well, and your profits go through the roof. Fundraiser discount cards make every fundraiser a winner – great product, great savings for the customer, and super profitable for you, without all of the involved planning and preparation that can stress you to the limits before you even get started. The great thing about fundraiser discount cards is that they are super effective whether used on their own or combined with any other product you sell or activity you participate in. The profit margins are outstanding, and the product offers real value to the customer, which is something you don’t see that much of today. Fundraising discount cards just make sense, and the value offered means that many more customers are likely to buy. Fundraiser discount cards are ideal; your customers can save an incredible amount of money, perhaps even hundreds of dollars, over the course of one year – for a measly $10! The Benefits of Fundraiser Discount Cards are Nearly Endless! fundraiser discount cards allow average people just like you to save a substantial amount of money on products and services they use anyway! Fundraiser Discount Cards Make it Possible to Raise Funds in a Snap! 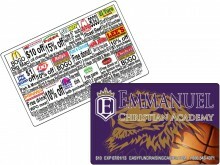 Fundraiser discount cards are the one product that allow you to raise funds faster than ever before. Organizing a fundraiser includes determining how much money you need, how many people will be in your group, and what the profit margin should be in order for you to raise the necessary funds. Some items offer a low profit margin, which means you have to sell more of the product in order to meet your needs.